The experience gained from the close monitoring of anti-Semitism and Holocaust issues for over two decades leaves no scope for misjudgments: anti-Semitism is still here; so are its derivatives, regardless of their grade and intensity, whenever and wherever onset. At his opening address during the 6th Global Forum for Combatting Anti-Semitism held in Jerusalem a week ago, the Israeli Minister of Diaspora Affairs, Mr Naftali Bennett, who spoke on behalf of ailing Prime Minister, Benjamin Netanyahu, was loud and clear. Using the starkest language before a remarkably broad audience of high-ranking European and American officials, active presidents, ministers and former prime ministers, Mr Bennett made clear that every single persecuted Jew, no matter the country or the continent, is actually Israel’s business. Although he abstained from incitements, contrary to Netanyahu who in 2015 encouraged the massive “aliyah”, namely the return of Jews to the Promised Land, he stood up for the power of Israel against those who threaten it, warning in parallel that Europe itself is the actual target. For their part, both Europeans and non-Europeans accepted the challenge. Although they admitted, like Manuel Valls, the threat is still menacing despite the legislative, educational, memorial and cultural measures taken in most European countries, that alone is not enough. The proof? Anti-Semitism, camouflaged and latent, rears its head, its many heads to be exact, just to remind us the undying hatred that keeps plaguing our society for centuries. And that is the key-word: hatred. Hatred against the Jews, which dates back even before the middle ages. It started with the first appearance of Star of David believers, was later dressed up with a religious cloak, proclaiming that the Jews where those who crucified Jesus – as if Jesus was not a Jew himself or Jeanne d’Arc was not sentenced to death by fire by the English-French or Socrates was not made to drink the conium by Greeks. However, as time went by, hatred became more pluralistic. Either through art, where repulsive faces of men – however surely Jews – would exploit honest and powerless Christians, or through the blooming of financial life in Europe in the years of industrial revolution which led to the establishment of stock organizations, companies and mass media, mostly Press, conquered by Jews when it came to religion, but always citizens of European states. During such years, Jews started taking the lead in the fields of music industry and science, holding high-ranking public posts. And this is how a question is begged: what is the element that, following the absolute extinguishment of 6 million European Jews, keeps generating anti-Semitism? Even today, after a number of measures aiming at informing the new generations and raising public awareness? 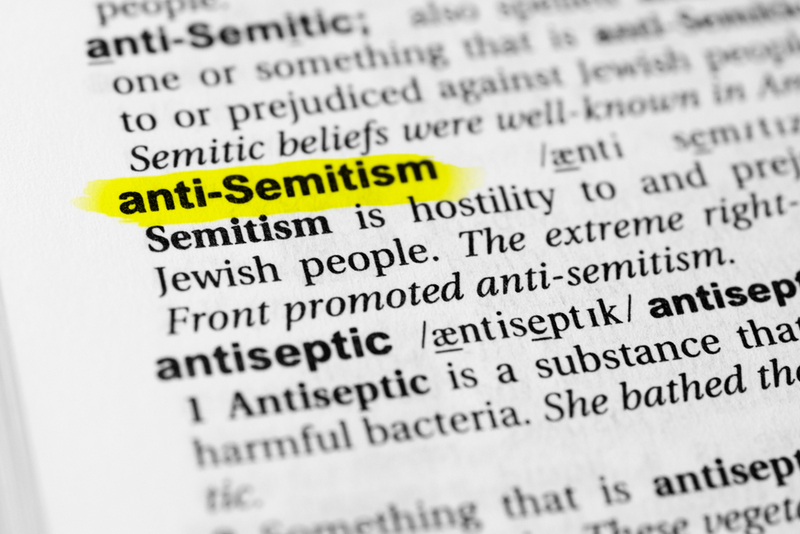 As if after the end of the war and the Holocaust, where nobody talked about anti-Semitism, anti-Semitism did not exist; and now that references are made thereto, anti-Semitism suddenly came out of the blue. That is why the stream is moving insidiously and secretly and we should worry simply because whatever starts with the Jews does not end with them. A glance into our world and the suffering pertaining to Boko Haram, the Yazidis, the Syrian refugees, the Christians in the Middle East would easily reveal that nobody should feel safe. Thus, given that the evolution of technology provides us with daily and direct information, why anti-Semitism is still here? Let’s take for example, Greece, the country with the admittedly least anti-Semitism instances in Europe, limited to graffiti vandalism. Although it is not an representative example, it would be a worth-dealing case study. Let’s see why. Greece is that country in Europe and the Balkans that outrageously suffered, primarily from the Turkish occupation entailing dozens of holocausts and much more repulsive crimes committed by the German Nazis. Yet! After the occupation, no anti-German or anti-Turkish and anti-Islamic mottos appeared again on the greek walls. So far so good. However, the question still exists. Why should anti-Semitism mottos exist in the first place? Did our country suffer from its Jew population? Of course not. Being Greeks themselves, just like their friends and neighbors, they should probably have shared the opposite experience. Christians would help the Germans just like good Christians saved persecuted Greek Jews. Even to the hardest reader who shall attempt to justify his anti-Semitism feelings by invoking – fully erroneously – the Israeli policy, the question remains the same: Did our country was adversely affected by Israel? Probably the opposite. And although a long time was required, nowadays the positive effect is evidently reflected by the cooperation of the two countries in the fields of economy and defense. So, what goes wrong? Should an effort be made in the name of a reciprocal relationship developed among different religious communities co-existing within our society, so that each “other’s” difference gets interpreted as regularity? In other words, a Greek who happens to be Jew in terms of religion and not in terms of origin, as broadly manifested by politicians and journalists, is not smarter or richer compared to his greek compatriots. Maybe some of them, even as a joke, get flattered and secretly happy by the aforementioned descriptions, but in fact, without even realizing it, they automatically marginalize themselves. So, knowledge is the key. As the basis of anti-Semitism is well-founded on one thing: ignorance.